I’m so excited! It’s definitely baby season around here. I have four friends who just had babies and two more who just found out they are pregnant. Three of my friends are neighbors and we get to hang out together with our babies. One of them just had their baby last week so I wanted to put together a little gift for her. After talking to a few new moms, I put together the perfect New Mom’s Survival Kit full of everything a new mom needs to take care of herself while taking care of a newborn. 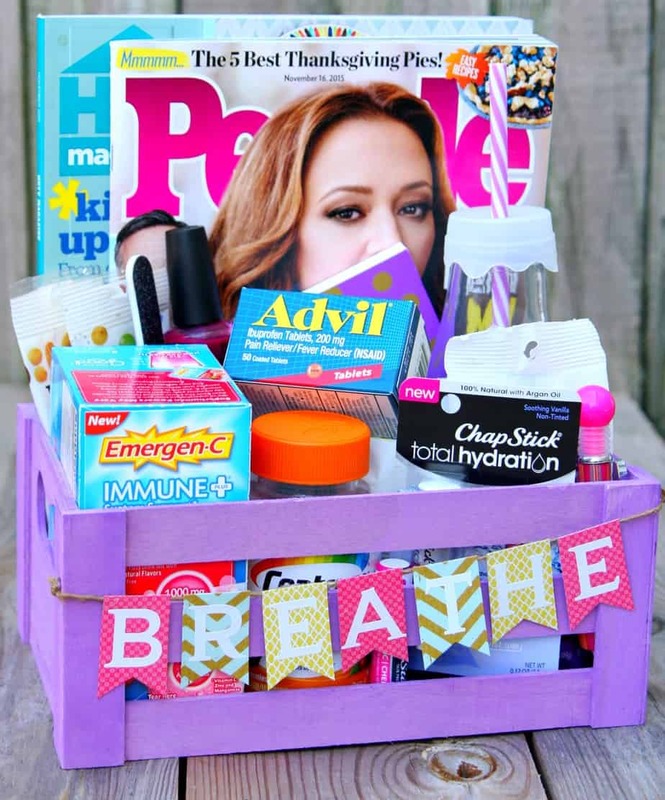 I love buying baby gifts for baby showers but I also love to put together little gift baskets for the new mom to enjoy after the baby is born. It seems like all the attention goes to the baby (which I totally get) but sometimes us busy moms need to take a moment for ourselves and just breath. 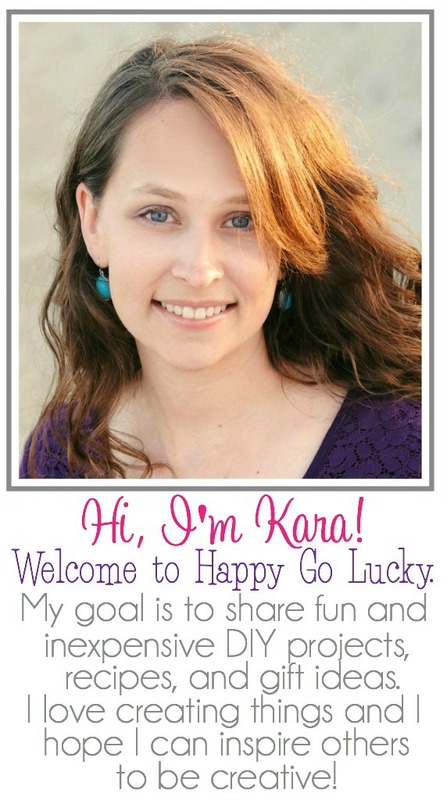 I think we are way too hard on ourselves and feel guilty if we put ourselves before our new baby. 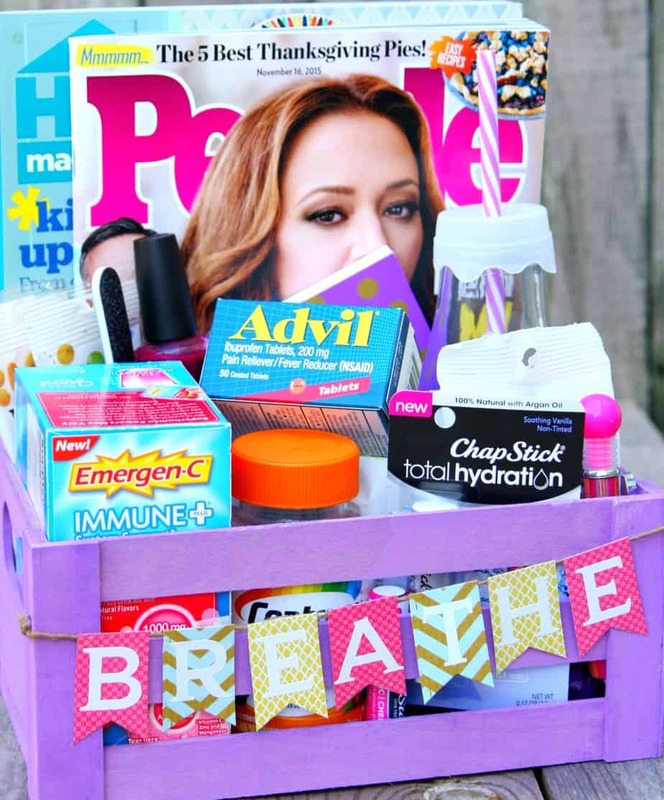 This gift basket is perfect because mom’s can take just a few minutes a day to focus on themselves without feeling guilty. 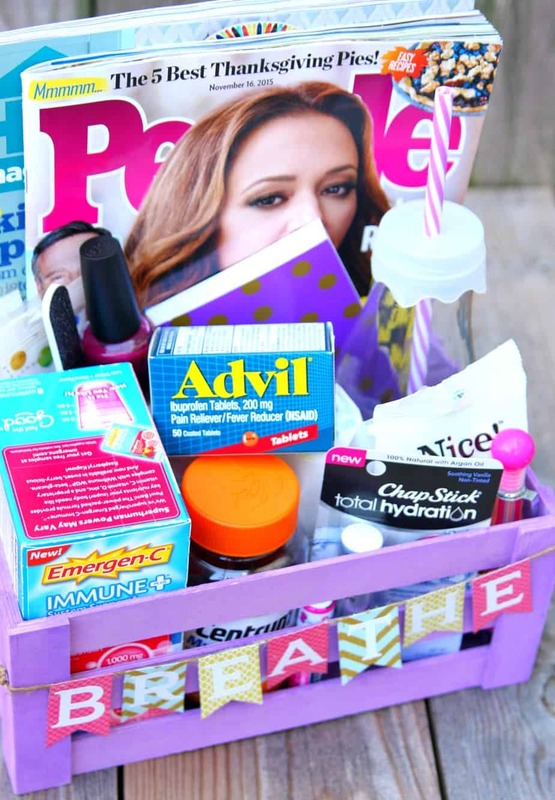 Of course you can customize the gift basket to include things you know your friend will enjoy but I wanted to include specific products that will help a new mom’s busy schedule. Advil is a must after giving birth and vitamins are important to keep your immune system strong when you aren’t getting a lot of sleep. The magazines and journal are great when you are breastfeeding to help pass the time. I also find that I think of all the things I need to do while I’m feeding the baby so the journal comes in handy. And you can’t go wrong with Chapstick, chocolate and a cute water bottle. I also added the word BREATHE because I feel like sometimes we need to be reminded to just breathe when we are stressed, tired and a little overwhelmed with a new baby. 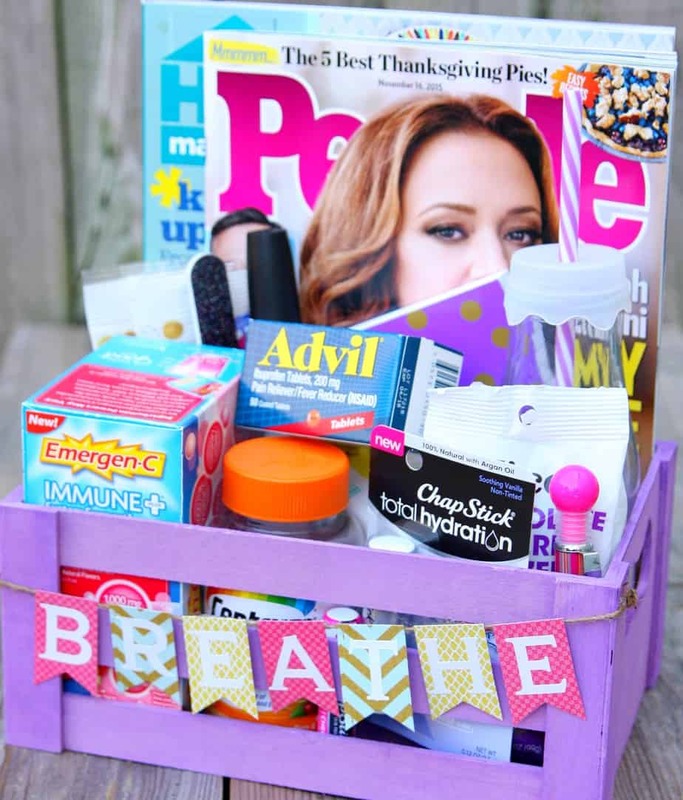 Walgreens has everything you need to put together a New Mom’s Survival Kit. And guess what? 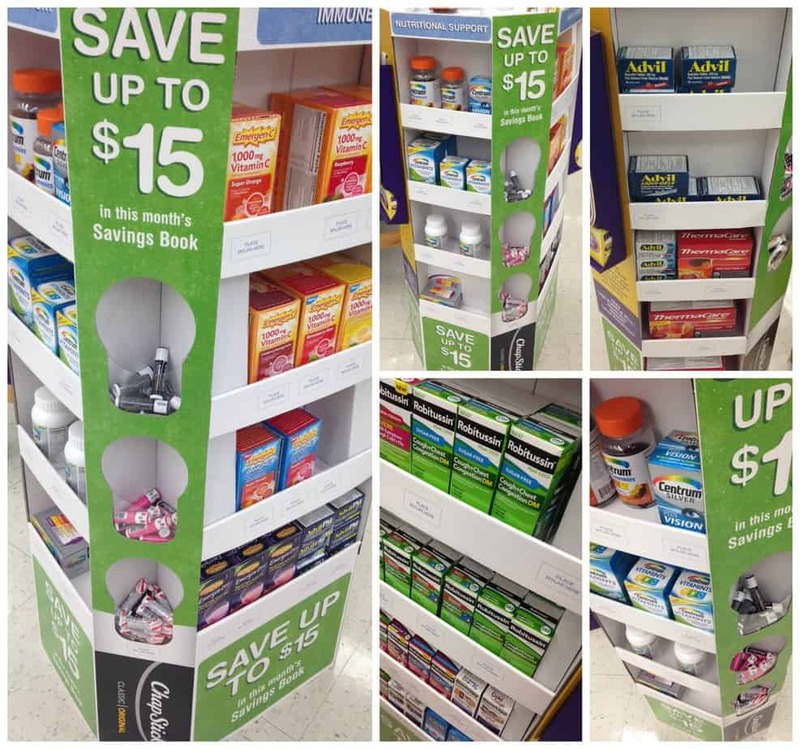 You can save $15 on Pfizer products this month so it’s the perfect time to stock up on everything you need. *Thank you Lindsey for pointing out that I spelled breathe wrong. This is what happens when you work on projects at 2 am while taking care of a newborn. Thank goodness I was able to fix it before I gave it to my friend. I think you mean breathe. Oh my goodness! You are so right!! Thank you for pointing that out before I gave it to my friend. I’ve fixed it and updated the pictures. Do you have a printable for that adorable “breathe” banner? Where did you get that cute “Breathe” banner? If you have a printable version of the Breath banner i would love a copy of it. I am in the middle of getting a basket ready for the new mom and came across your banner. Its perfect. .
Hey, such a cute idea! I want to make a basket like this. Where did you get the water bottle from? I found it in the dollar section at Target but it was a few years ago. I think there are similar ones at Walmart.